Since September the boys and girls in St. Sylvester's have been working on the Comenius project 'Pippi's Quest' with five other schools around Europe. These schools are located in Slovenia, Estonia, Germany, Spain and Iceland. All the children in the six European schools are reading and responding to the story of Pippi Longstocking. Pippi is an inquisitive and friendly character, who is inspiring the children to join her on a quest to learn more about other European countries and make friends with children all over Europe! Miss Staunton and her first class have put together an excellent video to show the other children in Europe our lovely school. The video also shows all the wonderful 'Pippi' work that has been happening in St. Sylvester's since September. Please take time to have a look at the video, and also to visit our 'Comenius Corner' outside and inside the P.E. hall where lots of our Pippi project is on display. P.S. You may have noticed the lovely drawing of Pippi at the top of this post. This was drawn by Reuben in Room 18, who won a competition organised amongst the six European schools to find a common logo for the entire project. It is now on display in all six countries! Each of the finalists from the six countries were given a beautiful Pippi goodie-bag as a prize. These bags were put together by Cecilia Kirke, a talented parent from our school, who did these as a complimentary gesture. 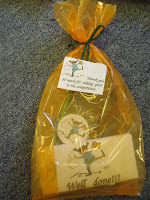 Cecilia has her own company 'BBonbon' which creates personalised favours and party bags for special occasions.